Gander Mountain may only have launched their e-commerce site a few years ago, but they are proving to be a quick study in online marketing. They implemented a number of best practices for email marketing which have helped drive a significant upswing in revenue, and their use of welcome series emails stands out as a shining example of one of their most effective tactics to date. 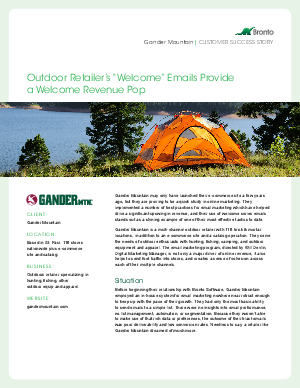 Gander Mountain is a multi-channel outdoor retailer with 116 brick & mortar locations, in addition to an e-commerce site and a catalog operation. They serve the needs of outdoor enthusiasts with hunting, fishing, camping, and outdoor equipment and apparel. The email marketing program, directed by Will Devlin, Digital Marketing Manager, is not only a major driver of online revenue, it also helps to send foot traffic into stores, and creates a sense of cohesion across each of their multiple channels. To gain insight on how you may employ some of the same tactics, read the full case study. Answer these short questions then click the Download now button.